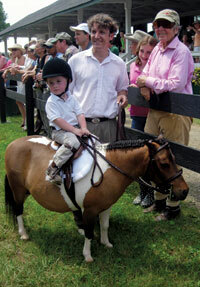 Garden of Equine Horticultural magic and horse-racing tales heat up Hunt Country. Billy, William and Mary Swift at the Upperville Colt and Horse Show. Horticultural magic and horse-racing tales heat up Hunt Country. Tis the season for garden parties. First, Donna and Jim Hackman’s Highland Spring Farm held “A Garden Party to Save Virginia’s Countryside,” given by the board of directors of the Land Trust of Virginia. About 400 concerned residents from Fauquier and Loudoun counties turned out for an evening out of The Great Gatsby. Instead of Nick Carraway, Tom and Daisy Buchanan, and Jay Gatsby strolling through a garden in East Egg, we had Missy and Bill Janes, Elaine and Childs Burden, Christine and Turner Smith, Sally Hosta and Edie and Bruce Smart. Donna Hackman’s horticultural skills are legendary. Her formal, English-inspired gardens spill over with masses of flowers in eye-popping hues and have been featured in several magazines. A flock of exotic chickens call a nearby log cabin home not far from the main house. And Donna’s goal of providing a habitat for birds and butterflies has been more than achieved in the form of a small frog-held court on the edge of a luscious pool of water lilies.